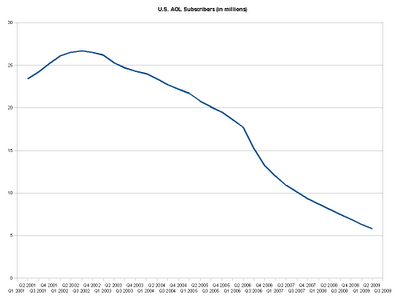 Check out this graph showing the number of AOL subscribers falling off a cliff over time. It looks like AOL reached its peak in the third quarter of 2002 at around 26 million subscribers. Sadly, half way through 2009 there were only 5 million sorry souls still going down with the ship. But 5 million is still a lot of misguideds - I'm like "yo, you know you can get off right", "you can still use AIM even if you don't subscribe to AOL..."
My question is (besides what the four toed statue is all about in Lost) at what point does the AOL exodus start to level off? 50,000? But I can’t imagine why those 50,000 subscribers would still be paying for a product that is free and superior elsewhere in the inbox marketplace. I mean, isn't it possible that in 50 years there won't be even one AOL subscriber? I see AOL as like a civilization with mad emigration - as much as when you jacked up the residential taxes in Sim City to 25% - coupled with no new births, and an average death rate. Eventually nobody will be left in the chatrooms. Some explanations: skip them if you just want to read about the Mayans. Emigration: people flock from AOL to gmail, yahoo, etc. I’d consider flocking to written letters from AOL, (and then still chat for free on AIM of course). There’s no reason to stick with AOL, besides stubbornness, and even less reason to pay for it. Average death rate: It’s possible that a lot of people won’t switch just out of complacency. Or maybe some people don’t see the monthly line on their credit card bill, and don’t realize they are still giving money away. These people will eventually die. 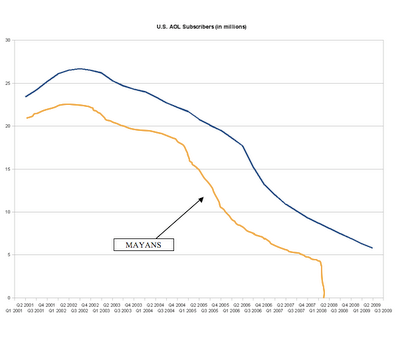 Now, look at the graph below, which shows the population trajectory of the Mayan people from back in the day overlaid on the AOL subscriber numbers. The lines kind of look like they fit don’t they? I mean, Al Gore proved the existence of Global Warming with a couple of lines that looked like each other. So what happened to the Mayans? What was the cause of one of the most mysterious vanishing acts in history, second only to the disappearance of the limo that carried Tupac’s assailants? My theory: they were early on the scene and had a good thing going, but then other people came along and started giving it away for free. So most members bounced, no new recruits showed up, and the holdouts eventually died.